A few light morning showers to slowly increasing sun. Temperatures falling through the 60s, 50s north. A windy front passed through New England overnight with a few spots recording wind gusts close to 50 miles per hour. The front is just getting offshore early this morning, with a few showers lingering behind that front. We are a bit damp in southeastern New England to start the day. The raindrops should end soon with sunshine for most by afternoon. The temperature is not going to move much with new air from Canada, high temperature in the 50s north and low 60s south. Wind from the northwest is diminishing to 10-15 miles an hour this afternoon. With a dry air, a clear sky and relatively light wind overnight, we will experience radiational cooling. That means scattered frost and freeze tomorrow morning, with low temperature in the 30s to low 40s south, and 20s to low 30s north. With sunshine tomorrow, the temperatures will recover to the 50s to near 60 degrees. 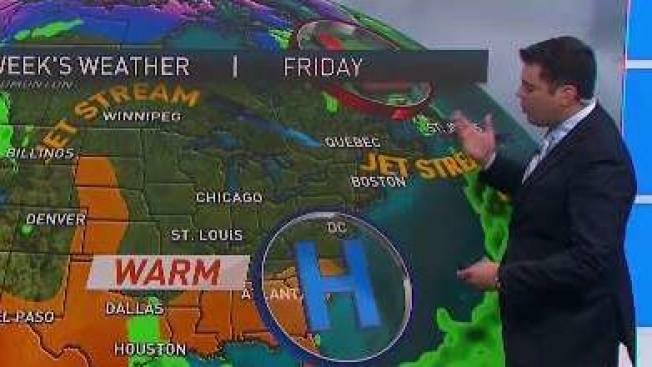 High pressure from Canada is going to set up over the East Coast all week long. That means day after day of sunshine with a gradual warming trend. After a chilly start again Wednesday morning, we will be close to 70 degrees for a high temperature. And it looks like that weather will stick around right into this weekend. For the annual Head of the Charles Regatta, the weather looks ideal, at least from this stand point.